From the author of the much-loved memoir Cottage for Sale, Must Be Moved comes an engaging and inspiring account of a daughter who must face her mother’s premature decline. 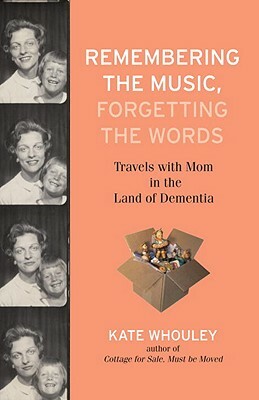 In Remembering the Music, Forgetting the Words, Kate Whouley strips away the romantic veneer of mother-daughter love to bare the toothed and tough reality of caring for a parent who is slowly losing her mind. Yet, this is not a dark or dour look at the demon of Alzheimer’s. Whouley shares the trying, the tender, and the sometimes hilarious moments in meeting the challenge also known as Mom. As her mother, Anne, falls into forgetting, Kate remembers for her. In Anne we meet a strong-minded, accidental feminist with a weakness for unreliable men. The first woman to apply for—and win—a department-head position in her school system, Anne was an innovative educator who poured her passion into her work. House-proud too, she made certain her Hummel figurines were dusted and arranged just so. But as her memory falters, so does her housekeeping. Surrounded by stacks of dirty dishes, piles of laundry, and months of unopened mail, Anne needs Kate’s help—but she doesn’t want to relinquish her hard-won independence any more than she wants to give up smoking. Time and time again, Kate must balance Anne’s often nonsensical demands with what she believes are the best decisions for her mother’s comfort and safety. This is familiar territory for anyone who has had to help a loved one in decline, but Kate finds new and different ways to approach her mother and her forgetting. Shuddering under the weight of accumulating bills and her mother’s frustrating, circular arguments, Kate realizes she must push past difficult family history to find compassion, empathy, and good humor. Kate Whouley lives on Cape Cod, Massachusetts, where she is the founder and owner of Books in Common, an independent book-industry consulting company. Her first book, Cottage for Sale, Must Be Moved, was a Book Sense Book-of-the-Year nominee. Whouley’s personal essays have appeared in the Cape Cod Times, Boston Globe, and the book-industry online journal Shelf Awareness.